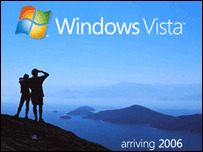 Microsoft plans to delay the consumer launch of its much-anticipated Windows Vista operating system to January 2007. It had originally aimed to launch Vista - the first major update since Windows XP was introduced five years ago - in the second half of 2006. Now, a version will be available for corporate customers from November 2006. Vista will then be rolled out for consumers after the holiday shopping season, said a spokesman for Microsoft - the world's biggest software maker. But analysts said this could throw some PC manufacturers and retailers into turmoil. "It's not the optimal situation, to be launching the next-generation version of Windows right after the big holiday sales season," said analyst Joe Wilcox at Jupiter Research. Microsoft is planning six versions of the next incarnation of its Windows operating system. Three versions of the software, called Vista, will be for home users, two will be for businesses and one will be for emerging markets. Vista, which was known as Longhorn during its long development, is a major re-working of Windows that makes changes, among other things, to the way the operating system looks and how it handles networking and sound. Microsoft said the six versions were designed to match the demands different users have for its software. No details have been given about the pricing of the separate versions. When Vista eventually hits the market, it will be the longest gap between releases of Windows systems. What do you think about Microsoft's plans to delay the consumer launch of its new Vista operating system until January 2007? Quite honestly Microsoft is going to find that it's going to have a very small user base if they delay release much more. People are already sick of waiting and those who have downloaded the beta (myself included) aren't too impressed by what they see. When Vista comes out not only will the Operating System be expensive in itself but it's going to demand a whole new computer to satisfy it's RAM and graphics needs. The way I see it, Linux or OSX is going to have a lot more users if Microsoft doesn't shape up very soon. I feel that if it where not for the dominance of Microsoft in the industry many manufacturers would have moved away from their software long ago. Many computer makers and retailers rely on the release of new operating systems to enhance their sales potential, as many consumers rather purchase a new computer than upgrade their operating system. This is going to mean a bad sales quarter for computer manufacturers. Could it be that delaying the launch of Vista until after Christmas is just a sassy marketing ploy? It couldn't possibly be that Microsoft wants to sell PCs with the obsolete Windows XP before Christmas and then force users to upgrade to Windows Vista in the New Year? Could it? The fact that Microsoft are prepared to miss the Christmas sales period suggests they may be giving product integrity a higher priority than previously. This sounds like good news for users. Let's hope they don't bow to pressure from hardware manufacturers to push it through early. For the long experience Microsoft has gathered in the field of OS business, it seems fairly reasonable that people should wait still longer for a more robust product unlike initial versions of Windows. We have the example of XP which took time to roll off but then it was able to beat all benchmarks. Lets hope MS has some incredible enhancement in pipeline. It's about time that Microsoft actually delivered a product that does everything that it is touted to do and delivers it properly. If they achieve this with the launch of Vista then the wait is a small price to pay. I must say that I'm disappointed with the news. On their past record, I believe Microsoft should not release it as early as 2007. Give them a little more time to debug it before they sell it to us to debug it for them. Windows is a highly inflated program that is now totally dominating the platform it operates on. Not only does the software require more and more resources due to its bloated size and poor coding but the idea of an operating system to just launch consumer programs has been totally lost to MS. What next integrated office in the operating system!